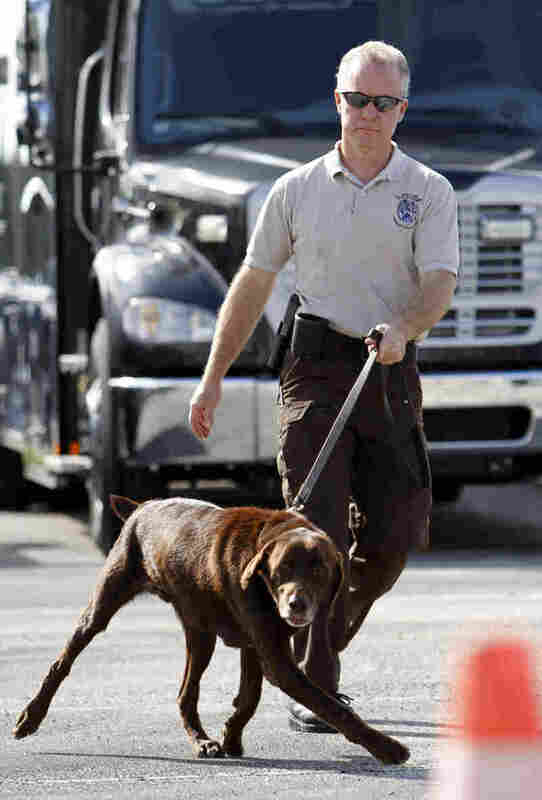 Drug-Sniffing Dogs Take Center Stage At U.S. Supreme Court The U.S. Supreme Court heard arguments in two cases Wednesday testing what, if any, limits there are to the police using drug-sniffing dogs. 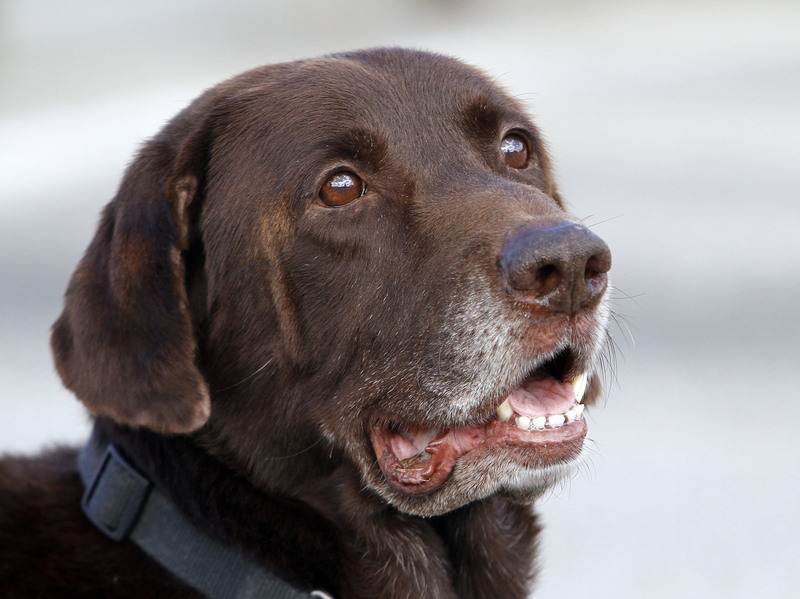 The cases centered on the use of Franky, a chocolate Labrador, and Aldo, a German shepherd. Miami-Dade Detective Douglas Bartelt and narcotics detector canine Franky give a demonstration in Miami in 2011. The U.S. Supreme Court heard arguments in two cases Wednesday testing what, if any, limits there are to the police using drug-sniffing dogs. By the close of two hours of argument, it looked very much as though the court would rule against the use of drug-sniffing dogs without a warrant in one case, but not the other. Lawyer Gregory Garre represented Florida police, prosecutors and the dogs in both cases, starting with the one that involved a dog sniff at the front door of a private home. Garre's argument, in defense of Franky's sniff at the home, was that Franky was trained only to look for drugs. In three prior cases, Garre reminded the justices, "the court has emphasized that a drug-detection dog reveals only the presence of contraband, and that nobody has a legitimate expectation of privacy in that." Justice Sonia Sotomayor added that if you have no expectation of privacy for contraband, "why bother with a search warrant" at all. Justice Ruth Bader Ginsburg chimed in that if a dog sniff of one home is OK, the police could just go down the street with a dog, going door to door. Garre responded that the police could indeed do that, just as they can knock on every door. But limited resources, he maintained, would prevent such dragnet searches. For Justice Antonin Scalia, the place of the dog sniff mattered, because a home is private. "It isn't sniffing in the abstract," he said, "it's sniffing at the front door." Justice Stephen Breyer also took issue with Garre's argument, saying that people do have the expectation that someone can come to the door, but not with "a large animal" who spends five to 15 minutes going back and forth sniffing the premises. Miami-Dade retired narcotics detector canine Franky looks on during a demonstration in Miami. Finally, Justice Elena Kagan observed that the court has repeatedly protected the home from technological surveillance without a warrant. To that, Garre responded, "Franky's nose is not technology." Kagan pressed the question, wondering if a machine were invented to detect drug odors from outside a house, would that be permissible without a warrant, too. Aldo had completed 120 hours of basic drug-detection training two years earlier but had not been recertified in 16 months — a defect that lawyer Garre acknowledged was "a lapse."